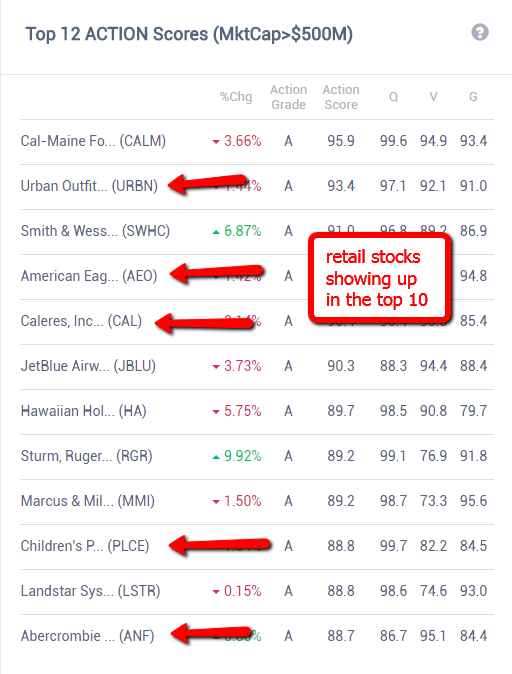 You saw in the last tutorial (How to Create Top 20 Portfolio) that a lot of retail stocks were in the list. When I run the backtests, it selects the top 20 stocks at the beginning of the year, holds for one year and then re-balances. 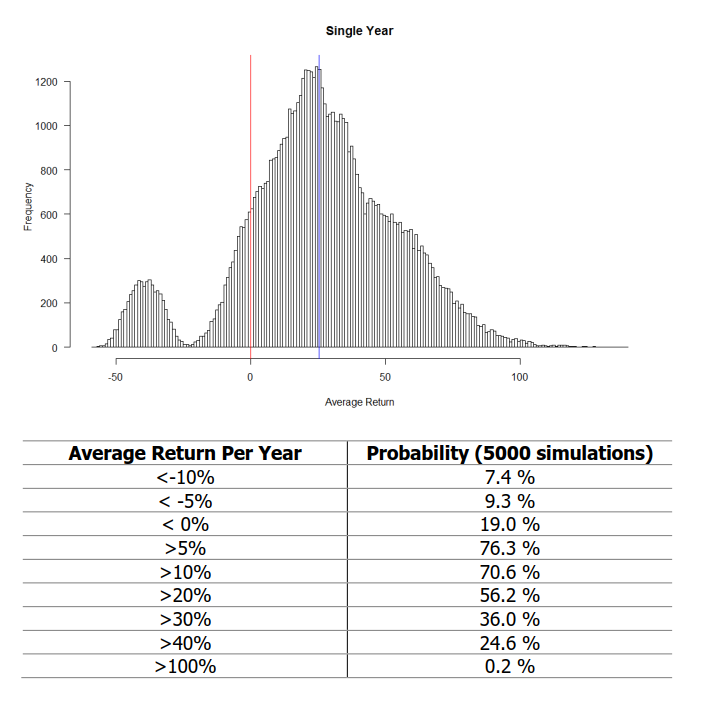 If you read the independent Action Score test report (log in > menu > download area), you likely came across this chart showing the possible distribution of returns. 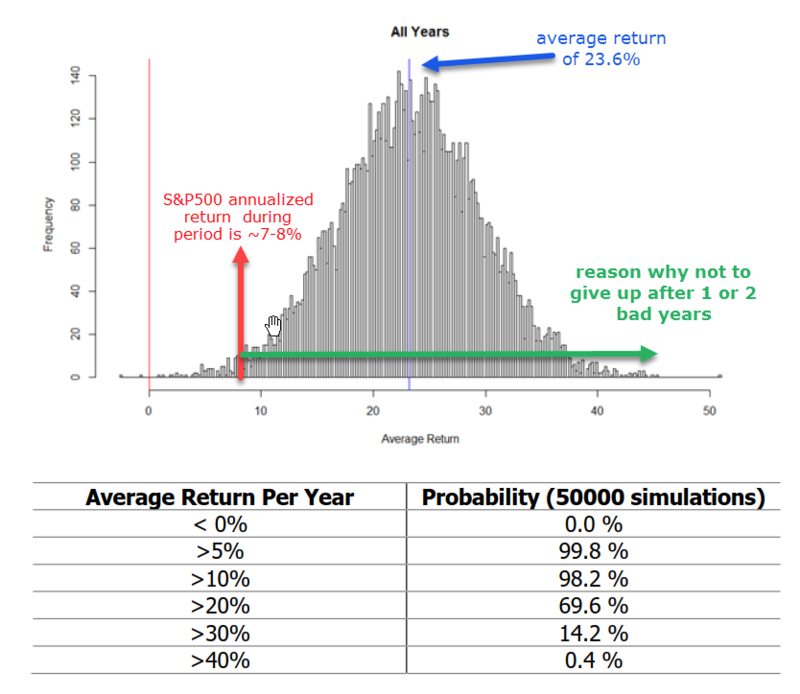 In this simulation, a single year between 1999-2015 was picked at random, and 20 A grade stocks were then randomly selected. This was performed 5000 times. The good news is that the ratio of a return greater than 0% is higher than negative returns. The 81% does not guarantee that you will make 23.2%. If the market is up 10%, you could finish with 5%. But the reason not to give up after 1 or 2 years is because of this. Over a 17 year period, the average return comes out to 23.6% (commissions, slippage, taxes not factored), the more likely scenario is going to be a return between 10-20%. The ratio of losing money is at 0% if you stick with it long enough. The ratio of beating the market is staggering. The key point is to remember that based upon extensive testing and a short history with real money accounts, it's proving to work. There will be a stocks that fall through the gaps and fall in the top 20 somehow. Simply put, there is no way to clean up every possible combination of Q,V,G across thousands of stocks. Spreading your bets eliminates this risk. To close, I want to share what Richard shared. He has been an OSV Insider from the early days and posted a great comment of his simple process. As Richard said, using your judgement can help you achieve greater returns, eliminate risk and help you focus on the best of breed.